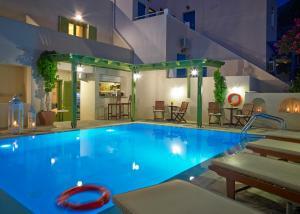 The family-run Studios Marios is located just 30 meters from Kamari beach and a short walk from restaurants, bars and shops. 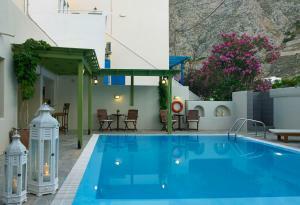 Air-conditioned room with a balcony overlooking the pool and mountains. It has a flat-screen TV with satellite channels, kettle and fridge. This air-conditioned studio includes a kitchenette with a stove, refrigerator and kitchenware, and a flat-screen satellite TV. This studio has a balcony with views of the pool and the mountain, air conditioning and a kitchenette with a stove, refrigerator and kitchenware. It has a flat-screen satellite TV. It's not possible to add extra beds to this bedroom. Overlooking the Aegean Sea, this air-conditioned studio has a balcony, a flat-screen satellite TV and a kitchenette with a mini-fridge. There is free Wi-Fi. Please note that this type of accommodation does not allow extra beds. Studio with a balcony, kitchenware and air conditioning.